Diet is an essential part of healing hidradenitis suppurativa (HS). In general, you want to avoid inflammatory foods such as grains, cow’s dairy, sugar, and refined vegetable oils. However, supplements can also be very helpful. 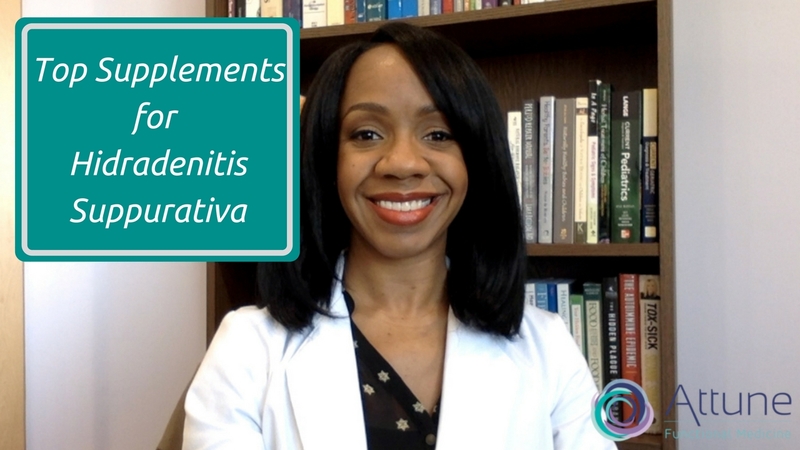 In this video, I’m going to talk about my top supplement recommendations for hidradenitis suppurativa. We recommend our Strategic Nutrients. It’s very absorbable and uses the active forms of nutrients to ensure effectiveness. Thanks for your question! Do you ever test VEGF in relation to HS? If so, do you tend to see lowered VEGF in HS patients? Would resveratrol lower VEGF even further? Thank you! I don’t typically test VEGF in my HS patients because it’s very expensive to order and it doesn’t change my treatment approach. I’m always looking for the underlying reasons why a person is experiencing their health issues. With that being said, we’ve found that many people with HS have a history of toxic mold exposure, and VEGF is also abnormal in people with mold toxicity. So I do order mold (mycotoxin) testing for my HS patients. Very interesting. We did have an issue with mold previously, remediated our home and healed. HS diagnosis was made a couple of years after healing. C4a levels are in a great range now but we’re 11,000+ when we had mold but now VEGF is low again. The low C4a numbers would indicate mold is not a current issue. Would you agree? We followed the shoemaker CIRS protocol. Very interesting, indeed! You are correct that C4a levels will fall into a healthy range when mold toxicity is no longer an issue. I’m glad you were able to get properly treated for mold; sadly, not many people are aware of this issue.